I have a Sharepoint list that I have created for testing purposes only. 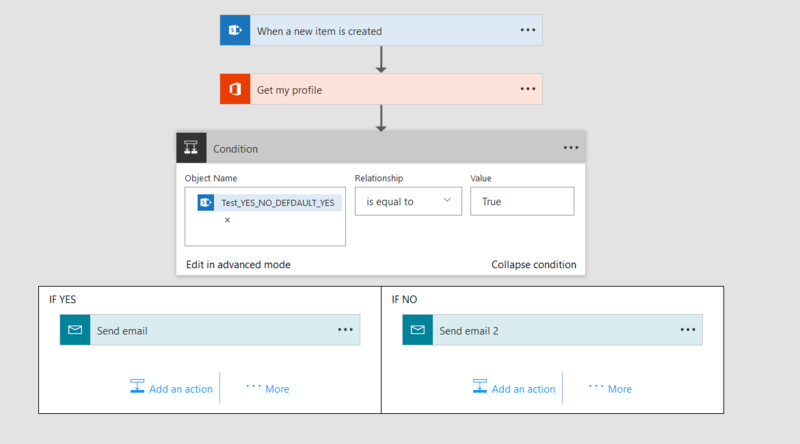 What I am testing is sending an email with different content based on a conditional in a Microsoft-flow process. The conditional looks at a Yes/ No column called Test_YES_NO_DEFAULT_YES. As the name implies, that column always sends back a YES. The process works fine, but the conditional always sends back the IF NO in the email. This is what the flow looks like! I have had tried 1, True, TRUE, true, yes, Yes, and YES with no results. What do I have to do In order for the conditional to execute the IF YES? Note that this is not the same as you tried (true), since writing "true" in Basic mode puts the string in the formula, instead of the bool value true. Not the answer you're looking for? Browse other questions tagged microsoft-flow or ask your own question.